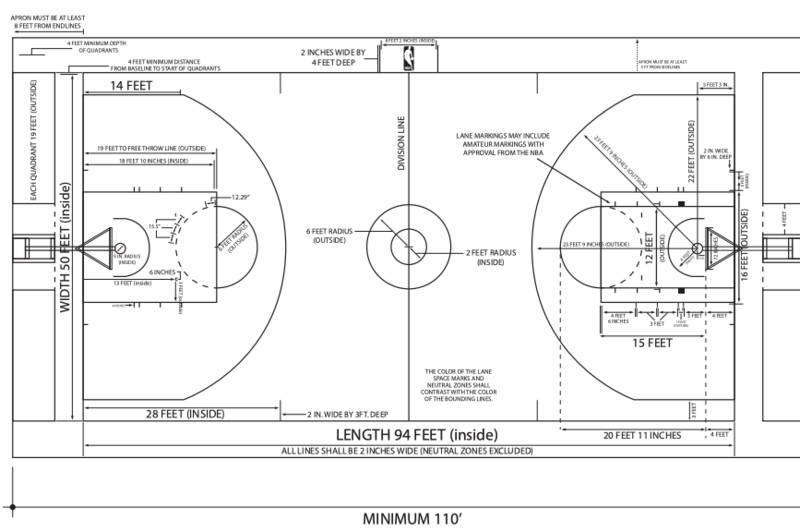 A free throw lane shall be marked at each end of the court with dimensions and markings as shown on the court diagram. All boundary lines are part of the lane; lane space marks and neutral zone marks are not. The areas identified by the lane space markings are 2” by 6” inches. A free throw line shall be drawn (2” wide) across each of the circles indicated in the court diagram. It shall be parallel to the end line and shall be 15’ from the plane of the face of the backboard. The three-point field goal area has parallel lines 3’ from the sidelines, extending from the baseline and an arc of 23’9” from the middle of the basket which intersects the parallel lines. Four hash marks shall be drawn (2” wide) perpendicular to the sideline on each side of the court and 28’ from the baseline. These hash marks shall extend 3’ onto the court. Two hash marks shall be drawn (2” wide) perpendicular to the baseline on each side of the free throw lane line. These hash marks shall be 3’ from the free throw lane line and extend 6” onto the court. Four hash marks shall be drawn (2” wide) parallel to the baseline on each side of the free throw circle. These hash marks shall be 13’ from the baseline and 3’ from the free throw lane lines and shall be 6” in length. Two hash marks shall be drawn (2” wide) perpendicular to the sideline, in front of the scorer ’s table, and 4’ on each side of the midcourt line. This will designate the Substitution Box. A Restricted Area shall be marked with a half-circle 4’ from the center of the basket ring and then parallel to the lane line to the face of the backboard with a solid two-inch line. The backboard shall be a rectangle measuring 6’ horizontally and 3 ½’ vertically. The front surface shall be flat and transparent. A transparent backboard shall be marked with a 2” white rectangle centered behind the This rectangle shall have outside dimensions of 24” horizontally and 18” vertically. Home management is required to have a spare board with supporting unit on hand for emergencies, and a steel tape or extension ruler and a level for use if necessary. Each basket shall consist of a pressure-release NBA approved metal safety ring 18” in inside diameter with a white cord net 18” in length. The cord of the net shall not be less than 30 thread nor more than 120 thread and shall be constructed to check the ball momentarily as it passes through the basket. Each basket ring shall be securely attached to the backboard with its upper edge 10’ above and parallel to the floor and equidistant from the vertical edges of the board. The nearest point of the inside edge of the ring shall be 6” from the plane of the face of the The ring shall be painted orange. (1) The ball shall be an officially approved NBA ball between 7 ½ and 8 ½ pounds pressure. (2) A minimum of nine balls must be made available to each team for pre-game warmup. NBA arena backboards must contain four strips of red LED lights, synchronized with the game clock, outlining the inside of the four sides of the backboard to indicate the expiration of time and one strip of an amber LED light to indicate the expiration of the shot clock.